SHATTER the glass ceiling of your income forever! Having wealth means different things to different people. For some, it's earning $500,000 a year. For others, it's $50 million. Are you willing to be wealthy? You might think the answer is obvious. And it's true that on the surface, almost everyone would like to have more money. But on a deeper level, many people unconsciously sabotage their own efforts. They're victims of early conditioning and a subconscious barrier that thwart their every attempt. If you believe that your answer to my question is truly YES, then it's time to make the necessary shift to create the kind of prosperity you've always dreamed of. In fact, I'm writing you today with a promise — and a special guarantee. I believe that in less than 30 days, you'll not only greatly improve your current financial position — perhaps even double your monthly income — you'll also develop both the attitude and the skills you'll need to reach the level of prosperity you want for the rest of your life! It comes down to creating a powerful money-attracting "Prosperity Consciousness" that will automatically bring you the wealth you want. In spite of what many people wrongly believe, accumulating wealth has nothing to do with luck, being born with money, or being aggressive. It's all about your mind: your attitude, your feelings about money, and your feelings about yourself. Think about the wealthy people you know. They don't have greater energy, intelligence, or ability than you do. But they do believe in their "right" to use money for their own benefit and enjoyment as well as for those around them. Prosperity Consciousness is a breakthrough program that will empower you to develop the same beliefs and attitudes of people who have created and sustained huge personal wealth. The next step is to make the subconscious your financial ally - literally training it to respond like a magnet in an electromagnetic field, whenever it comes in contact with the money-making opportunities that are always around us. 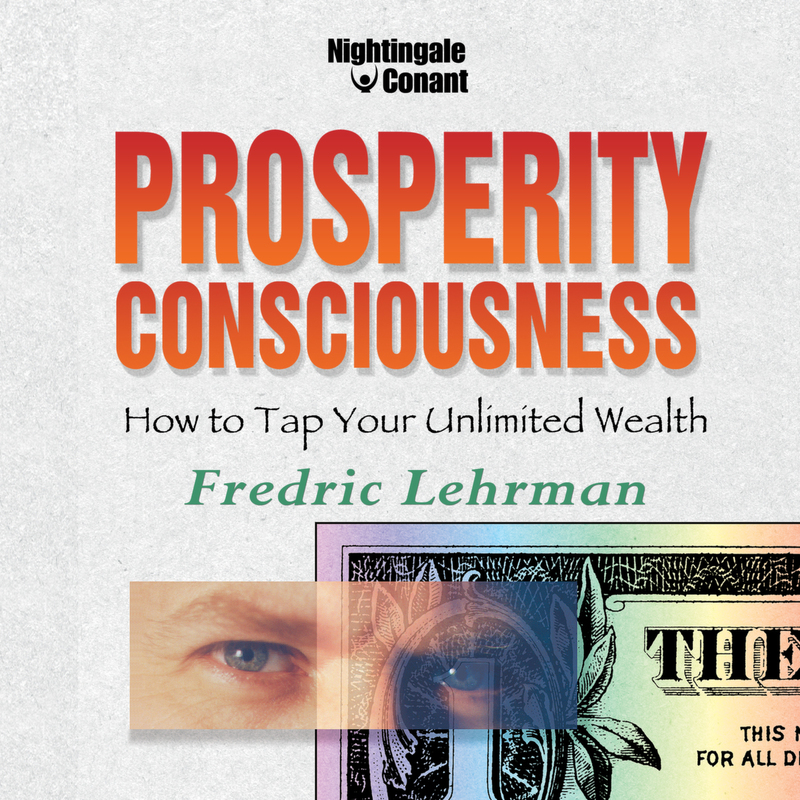 Fredric Lehrman, the author of Prosperity Consciousness, knows about the benefits of these techniques firsthand. In fact, he increased his income by 16 times the very first year he applied these concepts to his own life. This did not happen by working 16 times as hard, but by doing the things he liked to do in more intelligent ways. "Financial freedom is not guaranteed simply by having lots of money. What is required is a clear understanding of oneself and one's true purpose, coupled with the knowledge of how to build a firm financial structure. Then, even if circumstances force you to leave everything else behind, you will always be able to start over and quickly produce new wealth. Your freedom resides in you, and not in the money." You can make money AND have fun! A young woman buys the Rolls Royce she's always wanted and uses it to start a thriving business and enjoy a fabulous lifestyle. A lawyer takes a year off from a lucrative law practice to do nothing but relax. He makes more money in his year off than ever before. A man creates a business from his mistake of baking awful-tasting brownies. These are just a few of the fascinating case histories Fredric Lehrman uses to explain how you can make money by learning to think creatively. You'll discover how you can have fun doing exactly what you want to do and get paid for it. How you can dream your dream and make it a reality. It happens every minute of every day, and with the help of Prosperity Consciousness, it can happen to you. But there's more! You'll discover a repertoire of strategies for successfully managing - and keeping - the money you do make. Break the cycle of "just breaking even"
"Fredric Lehrman has an uncanny knack for leading people to simple but stunning insights. Prosperity Consciousness is a pearl of great value." "Fredric Lehrman has a keen intellect that can take a thing apart and so dazzle you while he's doing it, that you almost don't notice he's laid bare hidden self-limiting assumptions that were inhibiting your creativity." "Lehrman has a profound understanding of the connections between money, energy, and the mind. He sees their relationship with the subtlety of a T'ai Chi master and displays the aesthetic sensibilities of an accomplished classical musician. What's more, he can teach you these vital relationships in a way that's crystal clear and easy to implement." Can you improve your financial situation? ABSOLUTELY! You've already taken the critical first step: You read through this letter because you wanted your financial future to change. I don't have the slightest doubt that the information, skills, techniques, and insights you'll get with Prosperity Consciousness will dramatically change your ability to thrive financially in ways you've never before experienced. The opportunity to change your future is in your hands right now. Don't let it pass you by! Act quickly. Order Prosperity Consciousness today! P.S. If you think that being wealthy requires you to work harder, work longer, or not enjoy what you do, try Prosperity Consciousness now. It will change your mind - and your financial future - forever. Reprogramming negative thoughts. Taking charge of your financial destiny. Managing your finances with pleasure instead of anxiety. Deciding how much money is enough. Using the link between prosperity and self-esteem. Making people feel great when they pay you. Functioning with ease in the world of money. Giving your subconscious instructions it can't ignore. Using money as an exchange of energy. Making money serve you. Building a strong prosperity pyramid. Using affirmations to create material wealth. Relating affirmations to the phases of energy flow. Helping yourself in the world. Session 5 ~ Developing Your "Inner Real Estate"
Training your subconscious to tap into your own unlimited resources. The link between money and socializing. Dismantling the jackpot syndrome. Making people want to do business with you. Zapping "ego tantrums." A five-bank-account strategy to change your financial life forever. The income account to control the flow. The financial independence account to give you a prosperity framework. Using interest for pleasure. The large-purchases account to let you spend without guilt. Training your mind to attract money in new ways. How to create additional income just by thinking about it. The annual income account for financial freedom. Deciding how much you really need to live on. Increasing your cash flow by doing what you love. Using small figures to communicate with your subconscious. Using your investment account to feed your other accounts. Achieving financial clarity. to use credit cards. Getting debtors to pay you and enjoy it. Tithing and expanding the flow of energy in the world. Training yourself to steamroll income and streamline expenses. Playing the budget game to win. Working less and earning more. Getting your subconscious to exercise financial creativity and provide order and control. The fastest way to accumulate wealth. Over-coming the discomfort of selling. Making your mind a magnet for people with money. One magical quality in the selling process. Providing solutions for others. Training yourself to negotiate everything. An aptitude test to see if you have a survival job. How to make work a form of play and play a form of work. Using "Prosperity Scrabble" to recognize new opportunities. Making good ideas work in the real world. Learning from others. Becoming expert at finding experts. Starting a prosperity support group. Using self-esteem to build inner and outer wealth. Using prosperity to contribute to the solutions of society. I want to change my relationship with money and change my financial future forever. Please send me Fredric Lehrman's Prosperity Consciousness audio program, at the special price below. - I can select one of two ways of ordering.